Your X-stitch is coming along nicely and don't stress about crafting. It will come, but just now enjoy holiday time and you never know what will fire the imagination whilst away. Can't wait to see the plant stand. It is good to have a list of what you'd one day like to try, but if some things don't happen that is OK. You achieve so much anyway, a lot more than some people. As for sewing, dresses for you too high waisted and me too low waisted, so we would make an interesting combination if we ever stood side by side. (giggle) I'll always be here to give tips for patchwork if you ever want to try it. Enjoy that holiday with family, take care and huggles. The samper is very nice and I can't wait to see it complete! Also, I am curious about the plantstand you have mentioned. So love your cross stitch sampler! And also your blanket....both inspire me! Happy holidays! The best part of summer. Our school holiday ends in a couple weeks so I am making the most of the last days. Some more time at the cottage and an anniversary visit with hubby to our honey moon destination...Quebec City...we haven't been there in 30 years! Godspeed! It's been lovely to catch up with your last few posts Gillian. Your kitchen looks AMAZING, and I love the wall colour in your dining room. I too thought I would have a lot of time to craft in the holidays. I'm not sure what has happened really! Why do the days seem to fly past the older you get? My crafting this whole year has been limited, and I am only just picking up a blanket again after it being in a basket for 5 months. I really do hate that. I'm not very good at picking stuff up again after a long while. I'd love to see how a macrame plant hanger turns out when you do one. It's on my list of things to get done done also. Your sampler is lovely. I went through a stitching phase a few weeks ago and churned out 5 hoops (which I couldn't get enough of), but I think I'm stitched out now. My eyes seem to be wandering to loom buying...EEEEEK! p.s Loved your shelves with your cookbooks on. Colour organising is defo the best! Love those cross stitch kits from Alicia P. I wonder what yarn you are using on Angus blanket. Wool? Very pretty colors! I'm using a mixture of DK yarns, some acrylic and some a wool/acrylic blend, and a 4 mm hook. 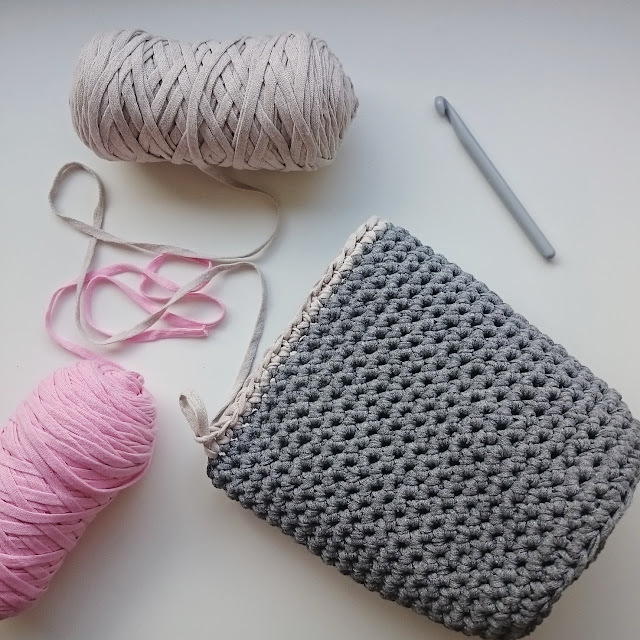 Ravelry is intimidating, a bit like being in a changing room with Olympic swimmers in their speedos when your costume is stretched out elastic and fraying. Just no use competing, and now way you can just dive in. I do like the cross stitch. How's it going? There is a lovely little book called Patchwork loves Embroidery by Gail Pan which combines small useful patchwork projects with embroidery - not cross stitch but backstitch. Hope your holiday was great.